The claim is often made that a conspiracy of General Motors, Standard Oil, Firestone Tires, et al killed off a thriving rail mass-transit system in Los Angeles. A brief version of why this is a myth is contained in a letter to the editor I wrote that was published in the Los Angeles Times. Read on for the full story. The current incarnation of this story dates to 1974, when Bradford Snell, a government attorney, testified before the Senate Judiciary Committee that General Motors and others had conspired to buy up and dismantle streetcar systems throughout the United States. He even claimed that they were convicted of "criminal conspiracy to monopolize ground transportation" in case No. 186 F2d 562, 1949. As we shall see, there was in fact such a court case, and GM, et al were convicted on one of the two counts in the case, but the bit about monopolizing transportation is a myth. This story got another big boost in 1988, when it formed part of the story in the movie "Who Framed Roger Rabbit?" In this telling, the evil character Doom reveals that he bought the Red Car system so that he could dismantle it to force people to drive on his new freeway. Another telling of this story was in a 1996 independent film titled "Taken For a Ride", which was shown on the PBS series "POV". This film made extensive use of Bradford Snell, and basically presented his opinion as established truth. This story has become so entrenched that it is accepted as fact by many people in Los Angeles. Problem is, it's just not true. Conspiring to monopolize sales of buses and supplies to companies owned by National City Lines. The defendents were aquitted on the first count. General Motors was convicted on the second count: "to monopolize the sale of supplies used by the local transportation companies controlled by the City Lines defendants." Which is to say, they were convicted of conspiring to have the GM-owned transit companies only buy GM buses. While this may be ethically questionable, it's pretty understandable, and it's nowhere near "criminal conspiracy to monopolize ground transportation." Note that nowhere in this case was there any mention of a conspiracy to replace streetcars with buses. Nor was there `conspiracy to monopolize ground transportation.' The first count comes close to this, but they were aquitted on this one. The replacement of streetcars with buses had actually been under way for several years. At the time, buses were seen as being more `modern' than streetcars, as well as being cheaper to run, quieter, and safer. Also, since buses do not run on fixed tracks, routes can be adjusted at will, and can be easily extended into new developments, which was a major concern in a rapidly-growing city like Los Angeles. The main point of this is that the streetcar companies were converting to buses anyway, and GM just wanted to make sure they bought GM buses. It was this case that Bradford Snell fundamentally misunderstood, and formed the basis for his Conspiracy Theory. As Sy Adler, a professor of urban studies who has researched this story says, "Everything Bradford Snell wrote...about transit in Los Angeles was wrong." The actual facts in the matter are that ridership on the Pacific Electric and LARY peaked in 1920. After that, ridership fell consistently over the years, with the only increase coming during the early 1940s, when wartime gasoline rationing forced people out of their cars. At the same time, the people of Los Angeles were becoming increasingly dissatisfied with the poor service and overcrowding on the streetcars, which led to the Major Street Traffic Plan of 1924. This was approved by the voters, and provided for money to widen and improve the main streets thoughout the city. This was a popular measure because the automobile was seen as a way for ordinary people to have an alternative to the streetcars. 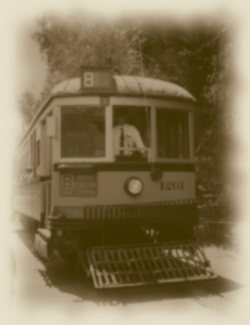 Another inconvenient fact for the conspiracy theorists is that the Pacific Electric (Red Cars) was never owned by National City Lines. It was owned by the Southern Pacific Railroad until 1953, when it was sold to Metropolitan Coach Lines. 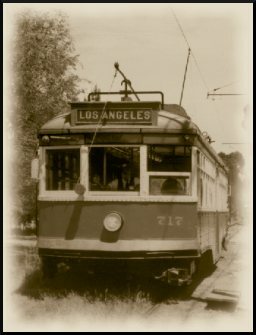 In 1957, it was sold to the Los Angeles Metropolitan Transit Authority, which presided over the final dismantling of the line in 1961. Also remember that the Pacific Electric was not really a profit-making enterprise in itself. It largely came into existance in order to help Henry Huntington make money on real estate. The Red Cars existed in order to allow new subdivisions to be built on the outskirts of Los Angeles. Once the houses were sold, the railroad was just an albatross as far as the developers were concerned. This was the origin of the poor service and overcrowding that led to people being unhappy with the streetcars. This story persists largely because of the natural human tendency to yearn for `the good old days', which are largely a figment of our collective imaginations. There are a lot of people who think that the dismantling of the old rail systems was a mistake, and it is much more comfortable to believe that some monolithic `they' did it, rather than to face the fact that it was the result of the individual decisions of thousands of people who chose to use their cars. Update: Some guy named Edwin Black disagrees with me. Read all about it. And here is my response to him. Bianco, Martha J. "Kennedy, 60 Minutes, and Roger Rabbit: Understanding Conspiracy-Theory Explanations of The Decline of Urban Mass Transit"
Bottles, Scott. Los Angeles and the Automobile: The Making of the Modern City. Slater, Cliff. "General Motors and the Demise of Streetcars"
Transportation Quarterly, Vol. 51, No. 3 Summer, 1997. The Straight Dope "Did General Motors destroy the LA mass transit system?" Kim, Gene. "Conspiracy theory doesn't match up to reality"
Hilton, George W. "What Did We Give Up With the Big Red Cars?"